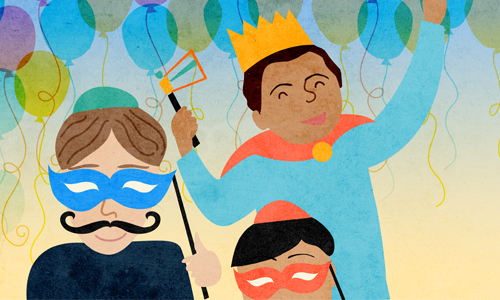 Why Do We Dress Up on Purim? In contrast to the overt miracles of the holidays of Passover, Chanukah and other Jewish holidays, the miracle of the holiday of Purim was disguised in natural events. Here is a sampling of the story: The king wanted his wife to come to a party; she did not want to, and she was killed. Then an evil man wanted the Jews dead and plotted to accomplish this with the approval of the king. The king remarried, and his new queen happened to be Jewish, and arranged for the decree to be countered. Only after the fact, when one looks at the entire story, does one realize the great miracle that transpired. For more, see Masquerade! and our additional articles on Dressing Up on Purim. See Shulchan Aruch, Orach Chaim 696:8. Minhagei Kol Aryeh. See Rabbi Moses Hagiz (18th century), Eileh Hamitzvot, p. 293. Bnei Yissaschar, vol. 2, in the chapters on Adar. Rabbi Shlomo Danah, Shalmei Todah (Inyanim Nifradim), p. 30. Why Name a Pastry After Haman the Wicked? Why Send “Mishloach Manot” Food Gifts Through a Messenger?